Sovereign Square, is an elegant mixed-use building compromising of 419 apartments at 545 Station Street, Box Hill. The building will stand 34 storeys tall, as a pioneering landmark building, with 360 views from Dandenong Hills to Melbourne City to Port Philip Bay. Sovereign Square will bring considerable residential regeneration and will further invigorate the City of Whitehorse retail and commercial districts. The complex will compromise of 2,677 square metres of commercial restaurant space, 715 square metres of ground food premises and 2,263 square metres of premium service office spaces. AXF Property’s Sovereign Square, will blend the very best influences of modern Asia with the Australian way of living, designed by Buchan Interior Designer Anita Bell. Anita Bell’s brief was “East meets West”, and was eager to deliver a modern Asian aesthetic. This has informed every selection and design in crafting sophisticated and beautiful spaced within this unique building. The five themes within the complex include Spring Dragon, the White Tiger, the Red Phoenix, the Black Tortoise and the Yellow Dragon. Architect Harvey Male, Principal of Buchan Architects, is passionate about Sovereign Square and what he believes the development will bring to the City of Whitehorse. “We have designed Sovereign Square to ensure a diverse mixed-use of facilities to encourage a connected sense of living to support a new vision for the community,” Mr Male said. “The lustrous metallic tile façade will make a stunning impact. These tiles have been selected specifically to capture and pixilate light and will have a luminous, shimmering effect during the day. The building will become a beautiful beacon in the midst of Box Hill and its surrounding suburbs. 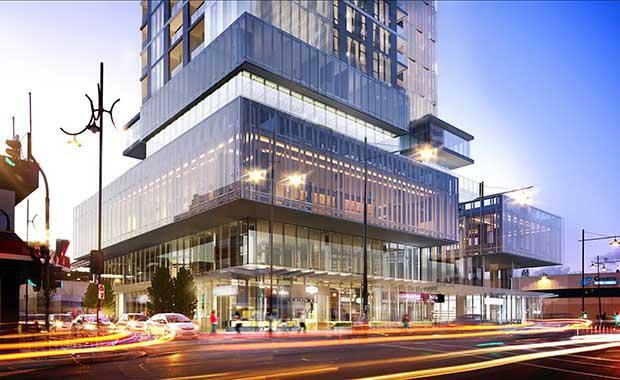 Sovereign Square completion date is scheduled for 2017.